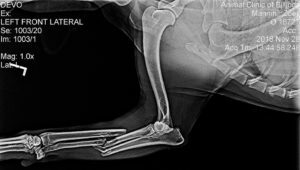 Fractures in dogs and cats are most often caused by trauma, such as being hit by a car or jumping or falling from a height. Fractures can also be caused by aggressive cancer that destroys the bone or by certain metabolic conditions that leach calcium from bone. Broken bones need support during healing so that a callus is able to bridge the gap across the fracture site. The simplest form of support is the traditional plaster cast applied to the outside of the limb, which is an example of external fixation (external to the body). The alternative is internal fixation, whereby an implant is applied directly across the fracture site internally, to support the bone while healing takes place. In all but the most minor fractures, internal fixation is superior to external fixation. Typically implants are made from inert metals, such as stainless steel and take the forms of pins, plates, screws, or wires. 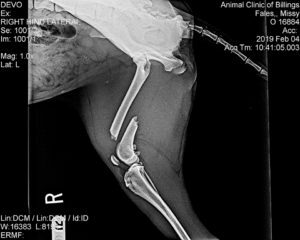 Internal fixation involves surgical procedures to piece the fracture together while your pet is under anesthesia. The simplest type of internal fixation consists of inserting a metal pin lengthwise into the center of the bone, so that the pin can act as an internal splint. 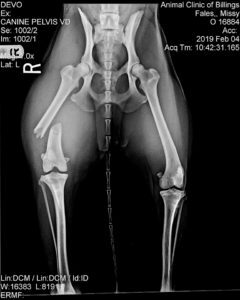 This type of internal fixation can work well for a small pet that has a simple fracture in the middle of a long bone, such as the femur, or thigh bone. In fractures that have multiple bone pieces or involve a joint, internal fixation is more complicated; the pieces need to be replaced manually and held in place with metal plates, pins, screws, and/or wire. Depending on the nature of the fracture and the method of repair, some implants are removed once healing is complete, whilst others are left in place for the remainder of the pet’s life. The complexity of the surgery depends on the size of the dog, the bones affected, and the seriousness of the fracture. The simplest types of fractures produce fine cracks near the middle of long bones, such as those in the legs. These hairline fractures cause little or no displacement of the bone, much like cracks in a windshield. Stronger impacts can cause the edges of the fractured pieces of the bone to separate, or the bone may shatter into multiple pieces, making repair more difficult. Fractures that involve a joint are even more serious. These types of fractures can interfere with movement and lead to arthritis long after the bone has healed. Fractures in which the bone is exposed are called “open” or “compound” fractures. In these serious fractures, jagged edges of the bone can pierce surrounding tissues and damage muscles, blood vessels, and nerves. In addition, because the bone is exposed to the outside environment, these types of fractures are often contaminated and serious infections that are difficult to resolve can develop. The objective of an internal fixation surgical procedure is to bring the pieces of bone into the correct alignment and to hold them firmly in place (ie, no movement) so that healing can occur. The patient is stabilized following the inciting trauma. Once stable, radiographs are taken both of the fracture site, and of the opposite limb for comparison. This surgeon uses the radiographs to decide on the best implant type to reduce the fracture, plus the size of plates, pins, or screws required. The dog is given a general anesthetic and the area clipped ready for surgery. Under strict aseptic conditions, the surgeon incises over the fracture site and dissects down to visualise the broken bones. Different techniques are required for different implant types, but the general rule is to immobilize the fracture pieces so that they cannot move against each other. This includes preventing any slippage of the fracture ends and also stopping any rotation around an implant such as an intramedullary pin. The fracture site is lavaged with sterile saline prior to closure, and local anesthetic may be instilled to reduce postoperative pain. Follow-up x-rays are taken to establish the repair is good, the operation site closed with skin sutures, and the patient woken. The majority of internal fixation surgeries lead to a good return to function of the fractured area. Success depends on several factors such as eliminating the risk of infection, selecting the most appropriate fixator, and good immobilization of the fracture. However, even the best surgery can fail if the dog weight bears too early, thus rest is essential. Alternatives to internal fixation include external fixation (casts) or internal-external fixators. Each method has its pros and cons, but unfortunately a simple cast is not a viable solution for all but the simplest of fractures in small bones such as toes. For fractured limbs, where the cost of reparative surgery is prohibitive or serious infection is present, amputation represents a humane option. Healing occurs at varying rates depending on the age of the pet, the type of fracture and severity of the damage, and the type of fixation. For example, young puppies generally heal within a few weeks, while healing can take several months in older dogs. In the immediate post-op period, pain relief is essential, and the dog must be prevented from licking the skin incision. While your pet is convalescing, your vet may recommend x-rays at various time intervals to gauge how healing is progressing and when your pet can return to full function. The sutures are removed after 10 to 14 days. State of healing x-rays are taken after two to four weeks. An average time to healing of non-complex fractures is 8 to 12 weeks, at which time further check radiographs are taken and a decision made about whether to remove the implant or not. 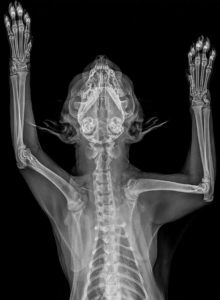 It is important to limit your pet’s activity during the healing process, so that the bones stay aligned and heal together properly. Rest is essential until the bone has fused and regained its own innate strength. Weight bearing and exercise ahead of this puts undo stress on the implant which could loosen or break. Too much activity can re-fracture the bone, delay healing, or lead to a deformed limb from stress on the weakened bone. Once full healing is achieved, the dog is slowly returned to exercise via a planned rehabilitation regime. List our POST-OPERATIVE CARE INSTRUCTIONS FOR MAJOR SURGICAL PROCEDURES page for after care rehabilitation information by clicking HERE. Compound fractures carry the risk of infection as a complication. This is a serious problem which can necessitate the removal of implants ahead of time and repeat reparative surgery once infection is brought under control. Common complications include loosening or bending of implants because undue strain is placed on them when the dog fails to rest. Again, this can necessitate repeat surgery to replace the implant. Owners need to commit to restricting their dog and controlling their activity levels during the 12-week healing period. Failure to do so can result in catastrophic implant failure and a return to the beginning of the repair process. Most fractures are the result of trauma, such as a road traffic accident. Adequately restraining the dog near roads and ensuring the dog is secure in a back yard are vital for preventing avoidable injury. In addition, good basic training ensures the dog has a good recall or sit, so the owner can control the dog at a distance during exercise. 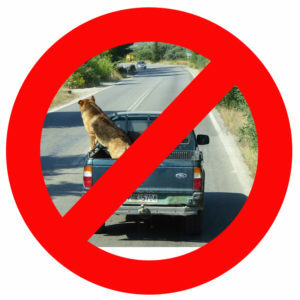 A long line should be used near traffic for those dogs without sufficient basic obedience to stop when commanded.